Our 530 LXF is now in production! Due to the overwhelming amount of interest in this model, we are anticipating being sold out for the first year. If you’re interested in more information, securing a build slot and placing a deposit on one of these industry-changing models, then please fill out the information below. Our Director of Sales & Marketing Alan Lang will receive your information and respond accordingly. Model availability is limited, so now is the time to act! Patent pending. With the touch of a button, you can electronically raise or lower the hardtop mounted rocket launchers. 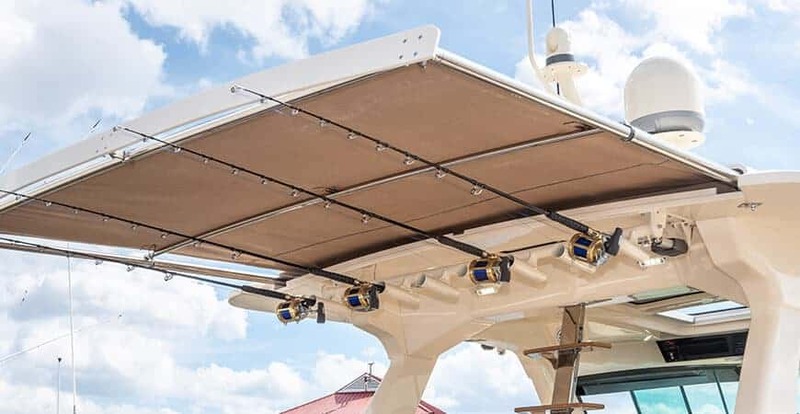 When the SureShade retractable awning is deployed, the rocket launchers will also lower electronically. 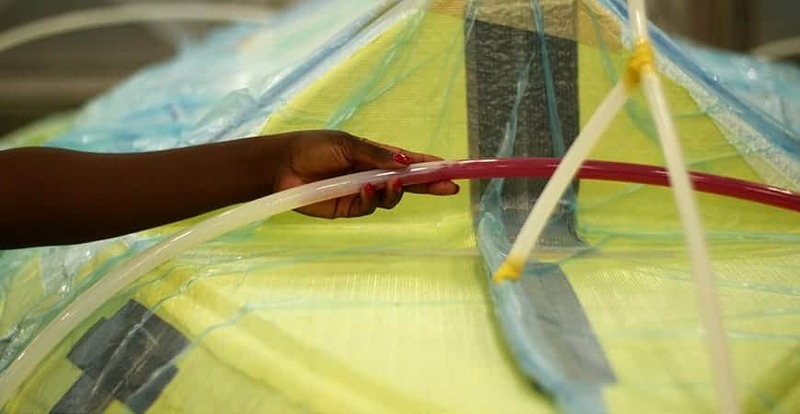 Having the rocket launchers articulate not only provides an added unique feature to the boat, but also helps with ease of loading/unloading rods. 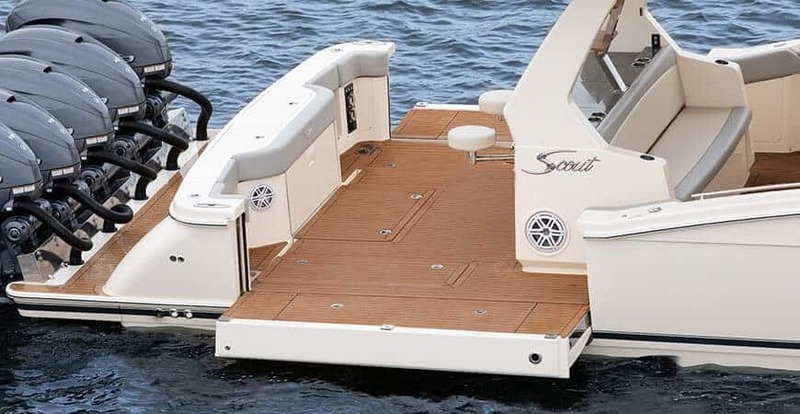 Dual electronically-actuated hydraulic beach platforms on the port/starboard side provide safe and easy access while boarding, de-boarding, and the ideal launch pad for water sports activities. When deployed, they create 17’ 10" of beam deck, ideal for entertaining with 150 sq. ft. of cockpit space, or when raised, 105 sq. ft. of fishing space. 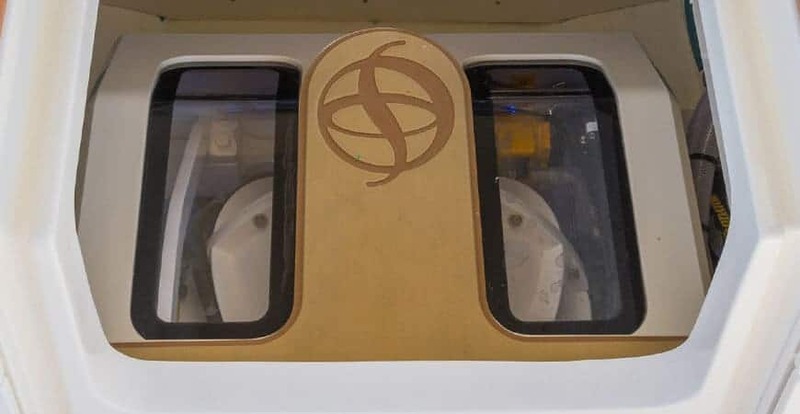 In addition to that, we have dual aft cockpit transom doors that fold out of the way, making navigating the stern a breeze. Control on-board systems with the touch of a screen. 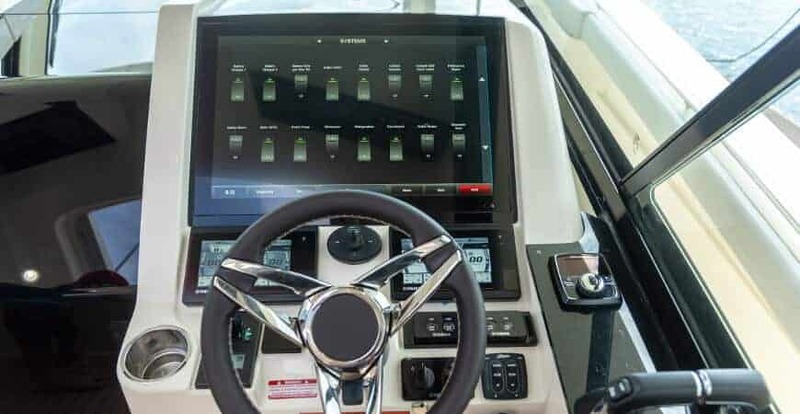 Garmin screens encased in glass bezels provide the technological touch you’ve come to expect, as well as the seamless, modern styling they represent. The Garmin GRID (Garmin Remote Interface Device) is a control pad with mouse that allows you to access and control all Garmin screens aboard the 530. Fully integrated into the 530 LXF, your standard Seakeeper 6 Gyro Stabilizer will provide you incredible comfort out on the water. Spin it up, and enjoy stability in the open seas as if you were on solid ground. The appointments down below are unmatched in a model this size. You’ll feel like you’re stepping into a private jet, or a luxury home. 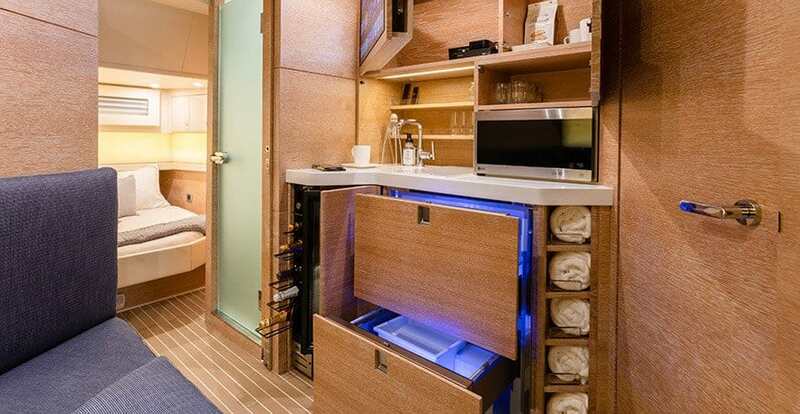 Private master stateroom, convertible sofa-to-berth, private aft berth, enclosed separate shower, enclosed separate head, galley and hanging closet...and plenty of other hidden storage. Choose from four, five or six engine configurations to meet your needs. 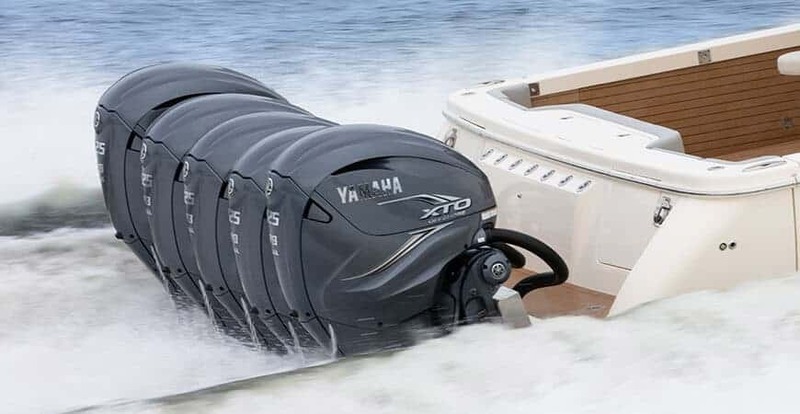 With incredible performance achieved with each outboard setup, you can choose the perfect option for you based on your appetite. Your 530 LXF will be personally delivered by our product specialist and certified USCG 100T Master Captain, Josh Slayton. 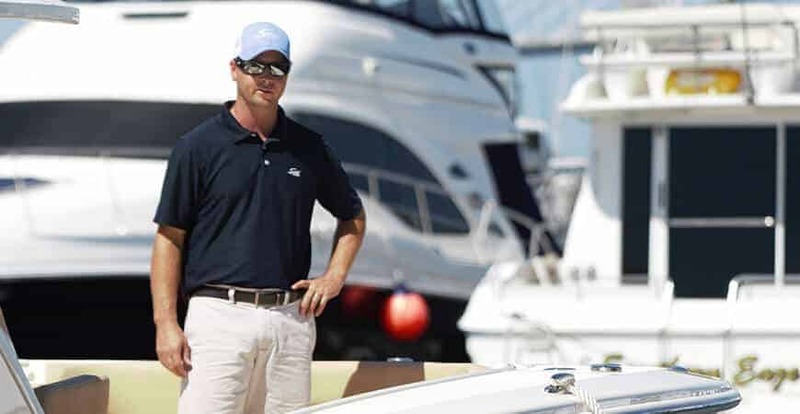 Mr. Slayton will not only deliver the boat to you, but he will also fully explain every innovative feature on the model as well as ensure you are completely comfortable with your 530 experience. It’s a personal, professional touch like no other. A Scout Representative will contact you.